"The hardest part of a marriage is between your 40's and 50's. I call it the traffic jam of life. You are going through menopause, your husband is going through a mid-life crisis, if you got kids they actin like they aint got no sense, meanwhile your parents are getting sick, his parents are getting sick. You trying to take care of them, hunnie, thats enough to break your marriage apart but you got to talk things out." Hahahaa!!! 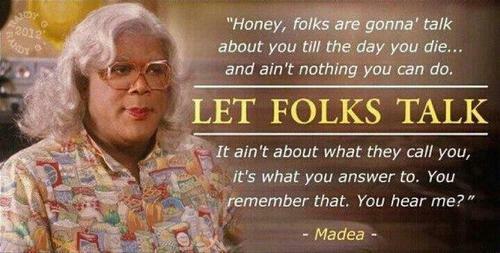 Madea Madea... dear old Madea! imagine I want to be like her to when i grow up! her level of wisdom is incredible n to think it comes from a hunk named Tyler! I saw this tonight and I was very glad to hear that I am not alone in this struggle. It is a very hard time, but very well worth it to spend the last few years with my parents. Word to the wise... take care of yourselves while you are younger. Otherwise, you will need help.